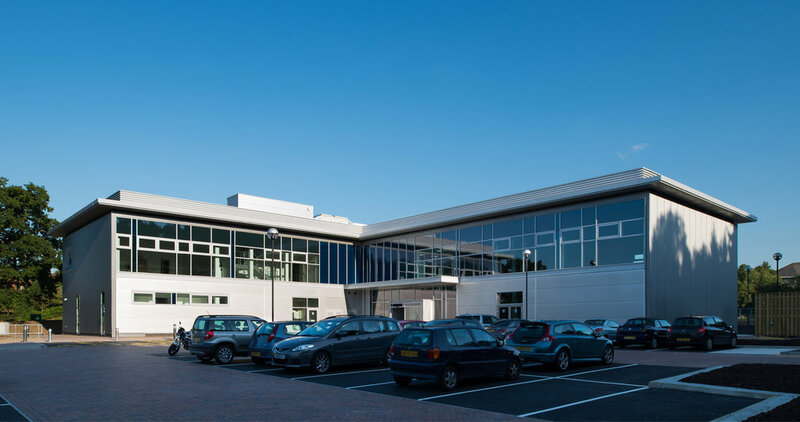 The Guildford Hospital is a world class veterinary oncology and soft tissue hospital located on the University of Surrey’s Research Park in Guildford. The design brief called for a highly specialised building, embodying a sense of quality, care, clinical excellence and professional integrity. Fitzpatrick Referrals are at the forefront of their field, and as such require a state of the art facility, which allows them to continue pushing at the forefront of the ever advancing field of cancer research. The hospital has a great deal in common with the most up-to-date human surgical hospitals, and includes, consultation rooms, theatre prep areas, operating theatres, ultra sound, x-ray and CAT scan imaging facilities, laboratories and chemo prep areas. A complex hierarchy of internal spaces respond to the needs of the patient, being animal friendly and designed to reduce the stresses associated with being in an unfamiliar environment.